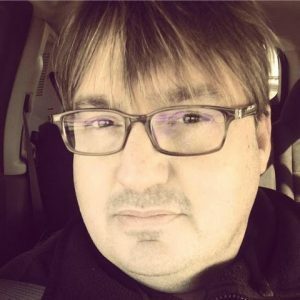 DAVID-MATTHEW BARNES is the award-winning author of several novels and collections of stage plays, monologues, scenes, and poetry. David-Matthew wrote and directed the coming-of-age indie film FROZEN STARS (starring Lana Parrilla of ABC’s Once Upon a Time), which received worldwide distribution. His screenplays and teleplays have been official selections in the Hollywood Screenplay Contest, the Inspired Minds Short Film and Screenplay Competition, the Universe Multicultural Film Festival, the Shore Scripts Screenwriting Competition in London, and the Film Makers TV Writing Competition in Los Angeles. 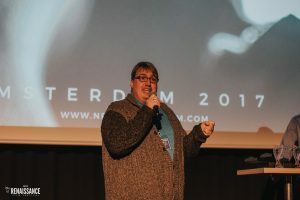 For his screenplay Boxcar, David-Matthew received the award for Best Short Screenplay at the 2017 New Renaissance Film Festival in Amsterdam. David-Matthew has written over fifty stage plays that have been performed in three languages in eight countries. His literary work has been featured in over one hundred publications. He has been an arts educator for more than a decade. Synopsis: Unable to attend their high school dance together, Austin and Harley decide to skip Homecoming and seek refuge in an abandoned boxcar. There, they dream of escaping the ultra conservative small town they live in, hoping to discover a place where they can exist and love without fear. 1. Congratulations on winning BEST SHORT SCREENPLAY at NRFF Amsterdam 2017. How was your festival experience? How does it feel to receive this award? 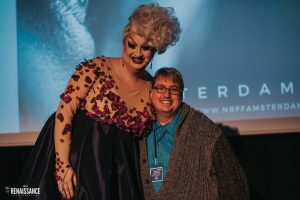 NRFF is a terrific festival. It’s truly one of the best. My experience at the festival was fantastic. 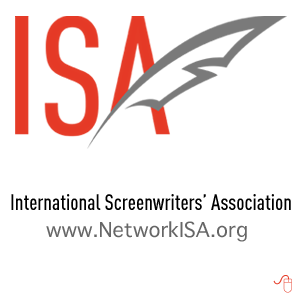 I met many other screenwriters and filmmakers there and saw some wonderful films. Receiving this award is a tremendous honor. It really feels like a form of encouragement to keep writing and to keep taking risks as a screenwriter. 2. Describe the central characters in “BOXCAR” and their journey? Austin and Harley are two young men who have seen and experienced a lot of emotional pain in their lives. Because of this and because of their age, everything around them feels very heightened and intense. These are two characters who are forced to hide their truth from the world around them. They dream about being free. The screenplay is about a point of no return for both of them. After the night the spend together in an abandoned boxcar baring their souls, nothing for these two young men will ever be the same. 3. What was your inspiration for writing this story? Boxcar felt like a story that needed to be told. A lot of my work is written for and about young people. Teenagers need us now, more than ever. They want us to be their best friend, their older brother or sister, their confidant. They want our experiences: the choices we made or didn’t, the decisions we’ve never second-guessed, the regrets we’ll always have. It is imperative that we share our lives with young people – not just through our words, but also by example. Some of this story came from my own life and experiences, but mostly it came from an awareness of how many young people can’t be who they truly are because the world around them won’t allow them to do so. 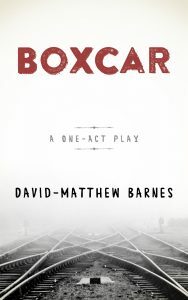 Before Boxcar was a screenplay, it was a one-act play. The play itself has really connected with audiences in productions around the country. Because of this, I felt inspired to adapt the script into a screenplay, with hope that the story could then reach an even bigger audience of young people. 4. Describe your writing process and how you researched your story. I write everyday, mostly in the early mornings. I have a home office that I work in. It’s quiet and comfortable and is the perfect place to create. As a college professor, I work with and see young people every day. Their stories and struggles really influenced Boxcar. Through them, I recognized a need for story like this. The only specific research I did was on types of trains, especially boxcars. There’s a wonderful museum in Sacramento called the California State Railroad Museum. I visited there before writing the story. 5. What would be your dream come true for “BOXCAR”? Who could you see playing the central characters? I really hope that a filmmaker discovers this script and brings it to the screen. This would allow the story to reach young audiences around the world. I’m not particular about who plays the roles of Austin and Harley, but I do hope I’ve created material that is challenging and rewarding for actors to explore and perform. 6. You’ve had commercial success as a screenwriter in TV and film. How did you get your break into the industry? I was a playwright before I was a screenwriter. While I was in college in Chicago, a woman named Bel Hernandez found out about a play of mine called Frozen Stars that was being performed in a small theater there. She wrote about the play in an industry magazine and within a year, my play was adapted into a feature film. I will always be indebted to her for her incredible support of me and that project. Since then, I’ve been very fortunate to continue working in television and film as a writer. 7. What has been your greatest achievement as a professional screenwriter? Aside from winning this award, one of my greatest achievements came when we were promoting Frozen Stars. Before the release, we took the film to high schools and screened it for students. I’ll never forget this young woman who came up to me and thanked me for making the film. She identified with the main character and felt I’d told a story that was similar to hers. In that moment, I understood the power of storytelling. 8. What do you think makes a good screenplay? Everything begins and ends with the script. A great story will always rise above the rest. When you combine masterful storytelling with unforgettable characters and truthful dialogue, the ingredients will be there to create something that will stand the test of time. 9. What advice would you give a screenwriter starting out? Study your craft. Read every screenplay you can. Learn from the screenwriters who have come before you. And be fearless. 10. are you working on anything new at the moment? I just finished writing a new young adult novel called The Marijuana Mermaids. It’s about three young woman in high school who are discovering their personal power. I’ve also created an original television series, adapted from my novel Ambrosia. The pilot script is starting to garner some great attention. 11. Where can people find out more about your work on the internet? They can connect with me via social media at Facebook, Twitter, or Instagram. They can also visit my website at www.davidmatthewbarnes.com.